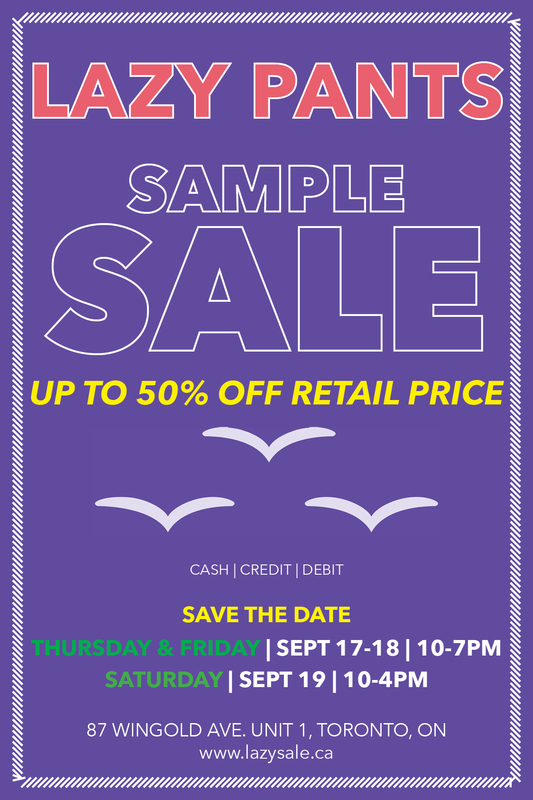 Sense something a little different about this sample sale at Standard Apparel? Well, yeah. This time ‘round it’s all about Lazy Pants, which will be featured in a full range of colours for women and children. So why are we telling you? You hate taking her clothes shopping, but she loves it. So what’s the most painless way to make her happy? Well, as far as trying stuff on goes, it’s tough to beat sweat pants for ease of use. On top of that you can look forward to 50% off, so you can look forward to setting her up for lounging and Netflix for the foreseeable future. One last thing: get there early. Not only does the best stuff go right away, but you’ve got some hanging out with your girlfriend and watching Netflix in your future. What? The Lazy Pants Sample Sale. When? Three days only. Thursday, September 17th, to Saturday, September 19th. Hours? Thursday and Friday, 10AM to 7PM; Saturday, 10am to 4pm. And can I follow this on social media? Sure thing. Hit them up on Facebook @StandardApparel, on Instagram @StandardApparelToronto, or on Twitter @StandardApparel. Oh, and don’t forget to check out their website.